This cover has been kept in a protective cover in a smoke and pet free home. It is a genuine cover with the original stamps and signature and is NOT a copy. The key info for the description is contained in the photo. This contains all the info on signature, series, stamp denominations, date, postmarks etc. The item shown is the one you will receive. World Cup team final - 10 players - not Bobby Moore. See my shop for a selection of other signed First Day Covers. You can view (with no obligation) and/or collect from Occold, Suffolk, IP23 7PW. I will accept cash or cheque on collection. 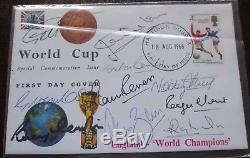 The item "FDC (First Day Cover) 1966 World Cup Final team, signed by 10 players, 18 Aug 66" is in sale since Tuesday, October 23, 2018. This item is in the category "Sports Memorabilia\Football Memorabilia\Postal Covers". The seller is "tigerbird1" and is located in Eye, Suffolk.